Current stock aggregation platforms are dated and don't address the needs of the modern investor. At the same time, there exists a segment new to the world of investing, unsure on how to get started and whose needs are underserved by current solutions. Delivered hi-fidelity MVP of a personalizable dashboard with prototypes of all key interactions. I led a team of 5 product designers through research, customer discovery, design and validation of the MVP. I also designed the recommendation widget for undervalued stocks. We worked with RockIQ to understand their vision, unique value proposition and what user outcomes they were interested in achieving, by building this product. We sought to understand how competitors are currently addressing this need and get a sense of essential features and components that a finance dashboard typically has. We then conducted user interviews to get to know target users, their motivations, pain points and concerns with respect to investing. With an idea of content that would go on the dashboard, We did a brand exploration exercise and two rounds of solution sketching the style and layout. We prototyped the dashboard with interactions to show the flow. 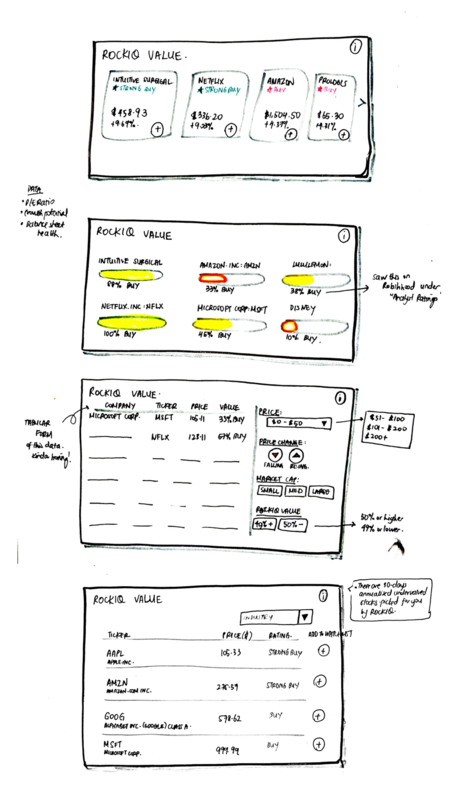 We tested the dashboard with potential users once after designing a lo-fi, to ensure we were headed in the right direction, conceptually, and once after designing the hi-fi, to test usability. RockIQ believes that current stock aggregation platforms are dated and don't address the needs of the modern investor. Their objective was to create an investment dashboard that allows beginner and intermediate investors to pick stocks to invest in without feeling overwhelmed with the plethora of financial information available. Our client believed in the potential of social sentiment as a quantifiable, real-time indicator for difficult-to-quantify components of company success. This was an assumption that needed further validation during user interviews. We performed comparative analysis via a component audit of the platforms and services currently in popular use. Component audit of popular stock brokerages and personal finance platforms. We quickly realized that these platforms inundate users with information, making it hard for the user to scour through the data to make an informed decision. Surely there is a way to improve the user experience. We interviewed 12 individuals to understand the profile of our potential user, their behaviors, motivations and goals for investing in the stock market. Particularly, we wanted to know how they perceived the value of social sentiment analysis in making stock picks. "I don't know well enough to invest in stocks..."
5/11 didn't know where or how to start investing. 7/11 turned to other resources, primarily Google and Youtube, for tutorials and videos to learn the basics and know what kind of information to take into account when investing. 4/11 thought better information on the tax implications of investing in the stock market would drive them to consider it more seriously. "Stock websites overwhelm me with information..."
8/11 liked the clean look and feel of Robinhood and felt the information there was more easily digestible. However, they also felt it was lacking in educating users on what information is critical in making an investment decision. "I wouldn't invest based on what people recommend on Twitter or Facebook..."
11/11 did not or would not trust sentiments expressed over social media, and wouldn't factor that as a data point in making an investment decision. 5/11 would consider input from a close friends, family, or people they personally know and trust to have a sense of the stock market. "I would look at earnings reports and trends in a company's stock price..."
6/11 trusted only hard numbers on the past performance of a company to objectively inform their investment decisions. We looked at how competitors implemented solutions to the above user stories for inspiration. Common elements that would need to be accessible throughout the dashboard would be, search bar, a navigation Panel, notifications and profile (settings). 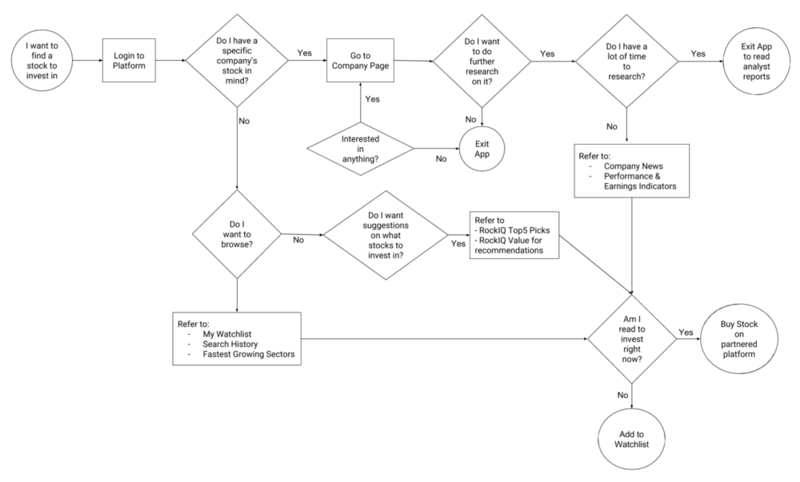 We developed a flow of the steps users would take in reaching their intended outcome, and the various decision points they will experience, and how they would use a particular feature or component in making an investment decision. With the key components of our information architecture and the user flow laid out, we ran two rounds of internal design studios where each of us designed for an aspect of the platform. Our clients didn’t want a standard dashboard, at the same time, we were dealing with financial information, for which standards existed when it came down to the visual representation of it. Over the next few days, we did a few iterations of Crazy 8s, coming up with as many contextually sensible variations of each component and of the overall layout. In line with delivering a personalizable solution, we landed on a widgetized approach to the dashboard - where users can remove data they don’t want to see, and select from a bucket of widgets, the data that they deem important on their dashboard. In addition to coming up with layout options for the dashboard as a whole, I owned the development of the component that RockIQ calls the "RockIQ Value" which highlights what its algorithm believes are undervalued stocks as attractive investment options to the users. Our clients expressed that they particularly liked the analogous color pairings used by companies like Stripe and Wealthfront, and the sleek but officious layout of Robinhood. Our challenge then was to assemble a palette that communicated these values while effectively highlighting important financial information where appropriate. We chose #6EF7EFF as the main brand color. 4 analogous colors were added - green and red to be used in indicating rising and falling stock values blue and magenta in allowing the viewer to distinguish between different visualizations, particularly line graphs. After agreeing on the sketches as a team, we each took ownership of a few components to wireframe. When putting our different widgets together, one glaring issue was that the inconsistency in sizing of the various widgets. Barring that and style issues, we were ready to validate the content of our lo-fi designs with real users. With feedback from our users, we got back to the drawing board. There were many more lo-fis and mid-fis that the team worked on between this and the final hi-fi stage, because it was important to iterate quickly, step back and see if made sense individually as a widget and as part of the whole. We delivered the final hi-fi designs below and did a final round of validation with another set of 5 users. Feedback from that round was mostly regarding fixing minor details within visualizations such as including axis labels and time period labels, but overall 5/5 users understood the goals of the platform, what they can achieve on it, and believed it ticked off all the boxes in terms of visual appeal. Overall, the client was pleased with our designs, they felt it was perfect as a starting point for them to have conversations when hiring engineers and product people, and to demonstrate to investors what their solution could look like. They mentioned that my weekly check-ins and updates as team lead, made it easier for them to keep track of our progress. They also appreciated the important work we did in the beginning as part of user interviews, to understand what features users would value in an MVP and importantly, what they don't, so the team could learn from that and pivot their strategy.